Pedal Power Hits Fusion Hill. May is an especially favorite time of the year for Fusion Hill. Spring is in full bloom, the lilacs along Marshall Street fill the air with their sweetness and – last, but not nearly least – it’s when we celebrate National Bike to Work Day (BTWD). Happening on May 19, BTWD is an annual celebration of active transportation. All around the Twin Cities (and the nation), events will be popping up that bicycle commuters can stop by to get complimentary breakfast and coffee, exchange high fives and even pick up a set of free bicycle lights. Our goal? To inspire others to get on their bikes any old day of the week and share what an amazing feeling it is to arrive at work via your own pedal power. Check out our Facebook and Instagram to see the adventure. SXSW PART 2: THROUGH THE CREATIVE LENS. What do Kona Brewing, Avon and Vogue have in common? The answer: representation at this year’s South by Southwest Interactive (SXSW), which our creative team attended in March. With session titles such as Origin-Based Marketing, Diversity Now, Courageous Creativity and Tech’s Lessons for Healthcare, SXSW truly offers an array of topics that reveal the intersection of creativity and technology. The streets of Austin were transformed into a visual playground for two weeks, and we found everything from National Geographic taking over a bar with virtual reality displays, to Casper – the online-only mattress company – setting up a sleep trailer for 10-minute nap sessions. We’re seeing this trend appear more and more in advertising. Companies are not simply promoting their products but also promoting a way of life and a point of view – be it social justice or politics. From GE’s Mildred Dresselhaus-focused campaign committing to hire 20,000 women by 2020 in the tech industry, to Heineken’s recent campaign about appreciating and respecting our differences, this trend was clearly present at SXSW. Many speakers also focused on data visualization: turning raw data into interesting visuals. One particularly effective talk, Persuasive Presentations, led by Harvard Business Review authors Nancy Duarte and Scott Berinato, broke down the essentials into context (who), content (why), construct (how) and connect (lasting impressions). Duarte charted famous speeches through time, from Martin Luther King Jr. to Barack Obama, to determine patterns of speaking. This approach, when paired with visuals that increasingly build on one another to form a story, helps retain interest and leaves the audience engaged. Amy Balliett of Killer Infographics shared a highly effective visual campaign done in partnership with We Count Seattle – a donation exchange website created for the homeless population – based on research showing that first impressions are 94% based on design. “Visual IQ is on the rise,” Balliett said. “Today’s consumers are pickier than ever, and people want to see a myriad of visual content before making a decision.” By leveraging strategic ad placement across free papers, billboards and buses – along with short-form content (which 95% of people prefer) focused on real stories and real faces – the campaign received 800 registered website users in the first 90 days. Over 350 items were exchanged on the platform. It’s a dynamic time for the health care and technology industries, and that message was clear at SXSW. Both industries are experiencing new and always-changing regulations as well as strong motivation to constantly improve upon themselves, become more affordable and become more available to the masses. Featuring leaders from HomeAway, RideAustin and the newly created Dell Medical School, one panel discussed how we could apply insights and successes from the tech world to attack health care challenges. According to the panel, the Affordable Care Act (ACA, or “Obamacare”) is the first major policy change in the last 60 years that allows the patient more choice than ever before and is at the center of this discussion. There are ways that health care and technology are integrated already, such as Yelp reviews driving patient referrals or the gamification of wellness via smartwatches and activity trackers (e.g., Fitbit). But further opportunities lie in the spaces of virtual reality or improved transportation and infrastructure. Dr. Tom Caven discussed new research using virtual reality as distraction therapy to help with phobias and anxieties as well as for pain amelioration. “We’re not trying to take the place of opiate medication but see if people can get by on a few less pills a day,” he said. Similarly, the panel discussed how applying ride sharing and a Meals-on-Wheels approach to health care could enable those who are without transportation to make their preventive care appointments and pick up their prescriptions – both actions that might prevent unnecessary hospitalizations. According to the panel, we are at the absolute beginning of health care’s maturation, and more cross-industry innovation will evolve. The Future’s Here, and It’s Digital. How many times per day do you use digital tools such as apps, fitness devices or smartwatches? You probably can’t even count, right? We know from our own experiences that digital tools are expanding into nearly every aspect of our lives. And the consumers we’re speaking to in the field have certainly verified this as well – even elderly populations and consumers of low socioeconomic status. Whether we are having conversations related to home energy, credit cards or health condition management, digital is becoming more and more a part of the conversation. So we decided to take a look at our recent research projects to understand exactly how and why consumers are using (or not using) digital tools. We uncovered several drivers that consumers desire or even require in digital interactions, and if your company is playing in this space, we highly recommend you take a look. Consumer personal health on demand (aka wearables) is still growing strong. If you don’t already have a fitness tracker, you might by the end of 2017 – and yours might be in the form of a ring rather than a watch. Consumers are becoming more and more connected. From smart homes to ceiling tiles that wirelessly power our devices, tech will continue to infiltrate our homes and lives. Artificial intelligence (AI) is no longer something seen only in sci-fi movies. Machine learning is ever increasing. For example, it’s apparent in the form of autonomous vehicles and personalized digital concierges like Wiidii. Technology is helping to level the playing field for consumers with disabilities, including apps that help the blind “see” and software that interprets and translates sign language. There’s a big part of our team who, we’ll be honest, loves nerding out on this stuff. But we also know understanding consumer expectations related to tech could have a big impact on your business. Read how by requesting our full trend report here. SXSW Interaction: Through Our Researchers’ Eyes. Have you ever wondered what a room full of creatives, innovators, researchers, music lovers, techies and financial gurus would be like? Look no further than South by Southwest Interactive (SXSW). In March, our team was right in the middle of this crowd in Austin, Texas. SXSW brings together individuals from across the world to discuss what’s next for consumers and businesses – and challenges them to drive innovation across all industries. Our researchers were excited to attend events that specifically addressed our areas of expertise: finance, health care and consumer-packaged goods. While they left with notepads full of ideas, the team wanted to share three key takeaways. We know technology is touching every area of our lives, and the speakers at SXSW wouldn’t disagree. Whether presenting on the future of mobile banking or the importance of health monitoring devices, the conference made it clear that we live in an increasingly digital world. Speakers specifically focused on how these advancements can directly resolve consumer needs. Fintech and virtual reality took center stage. Four full days of interactive sessions, panels and speakers left our researchers brewing with inspiration. Check back in May to learn what our creative team discovered at SXSW. Till Death Do Us Part: Committing to the Brands We Love. Think about your last shopping trip. Did you pause at the laundry detergent aisle to consider your options, or did you just grab your longtime favorite? How about the toothpaste and cereal aisles? For many of us, the choices are simple. That’s because we long ago formed relationships with brands we know and trust. In a world of ever-increasing options, achieving this brand loyalty is more important for brands than ever before. And that extends from the shoes we wear to the cars we drive and beyond. So, what is currently driving consumer brand loyalty? And how can you make a consumer trust your brand, not just buy your brand? We explored the answers in our recent Brand Loyalty Trend report. Consumers want to be engaged in a brand’s story and product. Companies that encourage collaboration with their consumers are more likely to create long-lasting relationships. Millennials are especially knowledgeable when it comes to what they buy, and they drive market trends because of their significant buying power. For many consumers, the quality of a product or service determines the likelihood that they will trust a brand with their repeat purchases and establish an ongoing relationship. However, consumers are also likely to cite reliably high-quality customer service as the reason for remaining loyal even after encountering issues with a brand’s product. Consumers are attracted to brands they view as altruistic and commit to companies that have a similar philosophy or values. They identify with and are more likely to stay loyal to brands that authentically demonstrate their commitment to social or environmental issues in their business practices. Consumers seek novelty and are more likely to be loyal to brands that pay attention to their individuality and respond accordingly. They develop trust and express satisfaction when brands continually surprise them with new products and experiences that are customized to their needs – or give consumers the power to customize on their own. In an oversaturated market, the consumer is king. Never underestimate the power of brand loyalty, and always invest in your consumers – getting to know their needs so you can speak to them more directly than your competition can. See five quick examples of companies that are succeeding, and learn how you can increase brand loyalty by requesting the full report. 1 2013 Cone Communications Social Impact Study. Proud To Be Women Owned. As we celebrate another Women’s History Month, we’re reminded of a stat we heard at the 3% Conference: In 2012, only 3% of creative directors in the United States were women. Anyone who has taken a tour of our offices will surely realize we’ve turned that number upside down. 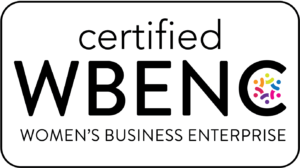 And, for many of our clients, being a women-owned business means we help them meet Tier 1 Diversity supplier standards. Yet our work in creating a diverse workplace certainly isn’t done. Celebrate diversity in all its forms, and be open to discussing it at work. Invest in personal development, whether that is presentation, diversity or leadership training. Prioritize giving your employees the tools they need to continue being successful. Join organizations in the community that celebrate women and diversity. Be a mentor to someone. Always be intentional about building each other up. Include men in these mentorship relationships, too, to avoid creating an echo chamber where women talk to women and no progress is made. We are proud to do our part to boost the ratio of women in our industry, and we hope you’ll join us. Connect with us on Twitter, and tell us what you’re doing to make your workplace more diverse – and more accepting.